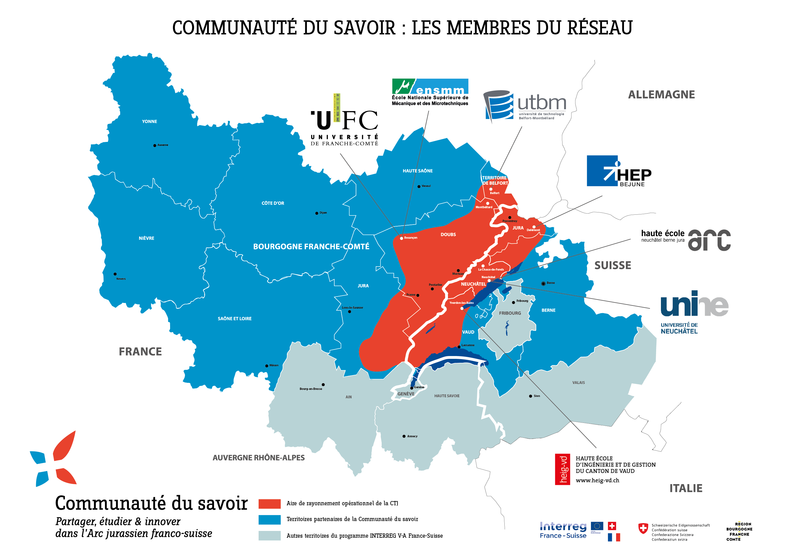 The Conférence TransJurassienne (CTJ), a cross-border political organisation in the Jura Arc, initiated the process which resulted in support from the France-Switzerland Interreg IV programme for the years 2013-2015. The project is led on the Swiss side by arcjurassien.ch and on the French side by the University of Franche-Comté. The project will continue until 2018, through funding secured under France-Switzerland Interreg V.
The partnership is likely to be expanded once the foundations of the CdS have been laid and its processes established. Merger initiatives in the regions and closer relationships between higher education institutes currently taking place on the French side will also be taken into account, for example the establishment of the University of Bourgogne Franche-Comté.